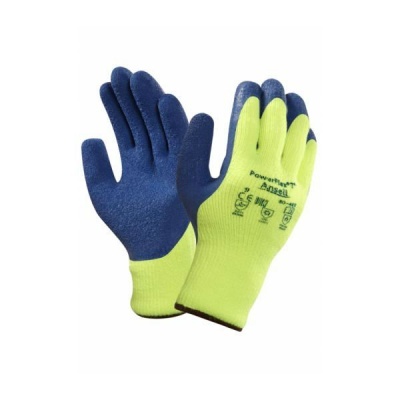 The Ansell Powerflex 80-400 Hi-Viz Thermal Gloves are general-purpose thermal gloves designed to provide exceptional insulation from the cold, with a high level of flexibility and good grip in both wet and dry conditions. Featuring a high-visibility colour scheme for improved safety in low or poor lighting, these gloves these are ideal for outdoor work, construction, public utilities and maintenance work. These gloves are available in two sizes - Size 7 to Size 11. To determine which size is best for you, please measure the circumference of your hand around the knuckles (excluding the thumb) with your hand open and your fingers together, and the length of your hand from the tip of your middle finger to your wrist.